Welcome to the second installment of a weekly segment where we dive into one Elder Scrolls Online’s many Sets, and explore what sort of Builds you can make. Not only will we show you how to get the most from these Sets, but we’ll explain where to get them, what requirements there are to obtain them (if any), and everything else you could possibly want to know about them. 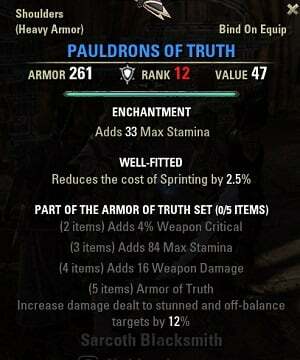 This week’s Set is almost never used, and perhaps vendored or deconstructed on acquisition: Armor of Truth. What the heck is Off Balance anyway? 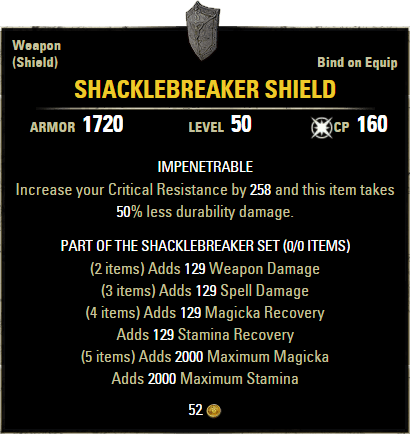 This Set was added to the game with Patch 1.3.3 in August of 2014, which was one of the most important Updates to Elder Scrolls Online, as it introduced 2 and 4 piece bonuses on MOST item Sets. Originally the 5 piece bonus increased your damage against Stunned and Off Balance targets by 12%, but was changed with the One Tamriel Update in the fall of 2016. It used to be obtained from vendors in Cyrodiil, but now is acquired by running the 4-man Dungeon Darkshade Caverns I or Dark Shade Caverns II. Since this is a Dungeon Set, you can get Weapons, Shields, Armor and Jewelry, but the Armor will always come in Heavy. The Traits on this Armor are random, so you may have to farm several times in order to get the ones that you need. Jewelry for this Set comes with the Healthy Trait, but there are unique Rings that come with the Robust Trait (Stamina), which would be quite useful for Builds using Armor of Truth. This Set caps out at 450 Weapon Damage added at Champion Rank 160 at Legendary quality making for a total of a whopping 579 Weapon Damage on it. Adding Major Brutality will increase this further by another 20%, the Werewolf passive Savage Strength will increase it by another 18% and finally Hircine’s Rage will increase it by another 10%. So if I did my calculation’s correctly, it is possible to gain 857 Weapon Damage from this Set alone while in Werewolf Form. That’s a lot, especially for a Heavy Armor Set. Off Balance looks like a white swirling ring about the target’s head. In the picture the target is also Stunned, but Off Balance isn’t dependent upon Stunning. Interrupting – Interrupting the casting or channeling of an ability will put a target Off Balance. 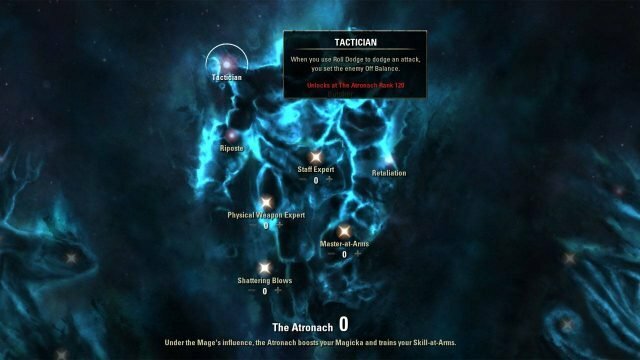 Tactician – This passive in The Atronach Champion Tree makes it so when you Roll Dodge an attack you set the target Off Balance. Interestingly this Champion Star will also cause Major Evasion to proc Off Balance as well (if it procs a Dodge). So Skills that provide this, can be useful here. Roar – Probably the best overall ability for reliably putting a target Off Balance. Veiled Strike – Very reliable, but you must be in Stealth to put your target Off Balance. Lava Whip – Very reliable, but requires an Immobilize or Stun of the target before you can put them Off Balance. Toppling Charge – Not extremely reliable because the target must be casting, but nonetheless a way that you can put a target Off Balance. Wall of Storms – Again not extremely reliable as there is some RNG involved, but again it is possible. Venom Arrow – Works nearly identical to the away Toppling Charge works. Crushing Shock – Works nearly identical to Toppling Charge and Venom Arrow. Shattering Rocks – Not extremely reliable, but can work well in larger fights. Deep Breath – Works nearly identical to Toppling Charge, Venom Arrow and Crushing Shock. This is a must have Skill for anyone using this Set. 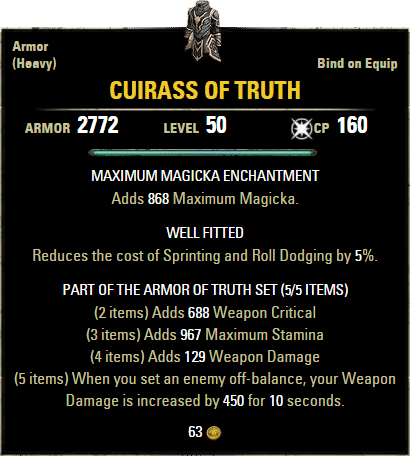 How this Set works is that whenever you set a target Off Balance you will gain the buff “Armor of Truth” for 10 seconds, increasing your Weapon Damage by the amount listed. It doesn’t matter how you set a target Off Balance, it will proc Armor of Truth. There used to be bugs with certain abilities applying Off Balance, but not granting Armor of Truth (as well as the Champion Star Tactician), but they have since been patched an are now working as intended. So why Armor of Truth with Werewolf? Well it should be quite obvious by now; the Werewolf Skill: Roar. 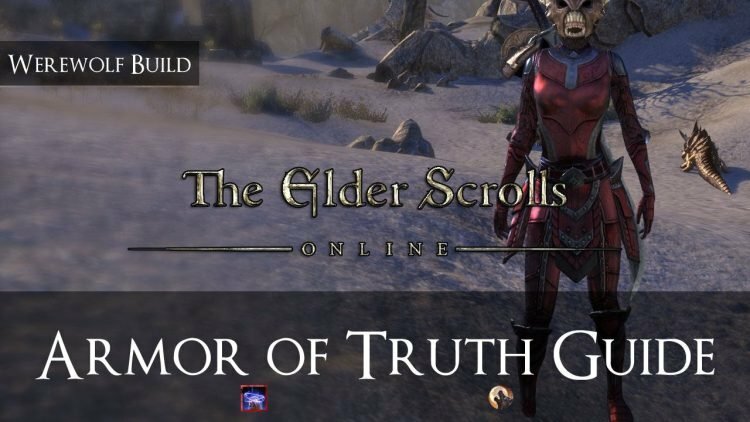 This ability will Fear and set Off Balance 3 targets with the push of a button, making it one of the most consistent ways to proc Armor of Truth in Elder Scrolls Online. In larger fights you can literally keep this buff up 100% of the time (it has no cooldown and can be refreshed), while making multiple targets vulnerable to Knockdown and Heavy Attacks. This also synergizes really well with Werewolves because they regain 100% more Stamina from Heavy Attacks, and thus will be using them quite often. Originally when I was writing this Guide, I added an entire section just to playing a Werewolf, but as I wrote, it got longer, and longer, and longer, and finally became its own article/video. So, instead of trying to cram all of that valuable information into a few paragraphs I will simply leave you with the link here, and embed the video below. It should explain EVERYTHING you could possibly want to know about playing a Werewolf; from Races and Classes, to recommended Champion Points and Sets, etc. PvE Werewolves shouldn’t really need to wear Heavy Armor, and I have a tough time imagining a scenario where it would out perform Medium Armor in a Dungeon or Trial. So if you’re going to run this set in PvE, I suggest using the two Robust (Stamina) variation of the rings, a Cuirass and Greaves of Truth and either the Healthy necklace or a Dagger or Sword of Truth. That way you’ll still maintain the Set, but will get the benefit 5 pieces of Medium Armor provide. I often run Dungeons in my PvP gear because I can’t be bothered to change (general Dungeon content isn’t that hard), so for those of you that are like me, then you’ll probably be ok running most things in the Heavy Armor setup as well. Because Armor of Truth won’t be helping you much outside of Werewolf Form (unless you happen to be a Nightblade), I highly recommend pairing it with the Salvation Set to reduce the cost of Werewolf Transformation until you have learned to play your Build a bit better. This will allow you to get into Werewolf Form more often, increasing the effectiveness of this Set. Be sure that you have the Champion Skill: Exploiter as it increases your damage against Off Balance targets by 10%, which will be a good amount with this setup. You will need 75 Champion Points into The Ritual to achieve this, but that shouldn’t be hard to do since that is where a good chunk of your points will be anyhow. 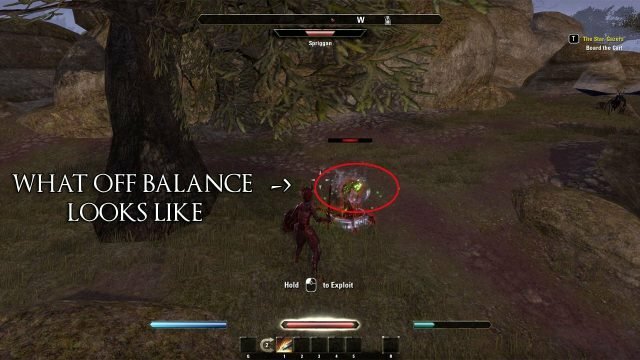 Molag Kena, again is a Set that normally is great on its own, but in a Werewolf’s hands becomes even more valuable because you take advantage of both the increase to Weapon Damage and Spell Damage. If for some reason you can’t get two pieces of this Set, or simply don’t have either the head or shoulders, consider mixing 1 piece of it with 1 piece of Domihaus. The one piece bonus is the best of any Monster Helm Set in the game, adding 1096 Max Magica and Stamina! Lastly, using this Set effectively is not easy and you shouldn’t be discouraged by early failures or by early failures as a Werewolf. Playing one in ESO takes serious commitment and isn’t recommended for new players, especially not in PvP. I’ll leave you with a video of some gameplay of this sort of Build. This is not my gameplay but another’s who has done many Werewolf videos both PvP and PvE. Enjoy! Thank you for these great guides. They are so needed and greatly appreciated.